The protesters rallied in central Barcelona, waving Spanish and Catalan flags and banners saying "Catalonia is Spain" and "Together we are stronger", as politicians on both sides hardened their positions in the country's worst political crisis for decades. Barcelona: Tens of thousands of people took to the streets of Catalonia's capital Barcelona on Sunday to express their opposition to any declaration of independence from Spain, showing how divided the region is on the issue. Spanish Prime Minister Mariano Rajoy said on Saturday he would not rule out removing Catalonia's government and calling a fresh local election if it claimed independence, as well as suspending the region's existing autonomous status. The stark warning came days before Catalan leader Carles Puigdemont is expected to address the region's parliament, on Tuesday, when he could unilaterally declare independence. "We feel both Catalan and Spanish," Araceli Ponze, 72, said as she rallied in Barcelona. "We are facing a tremendous unknown. We will see what happens this week but we have to speak out very loudly so they know what we want." The wealthy northeastern region of 7.5 million people, which has its own language and culture, held an independence referendum on Oct. 1 in defiance of a Spanish court ban. 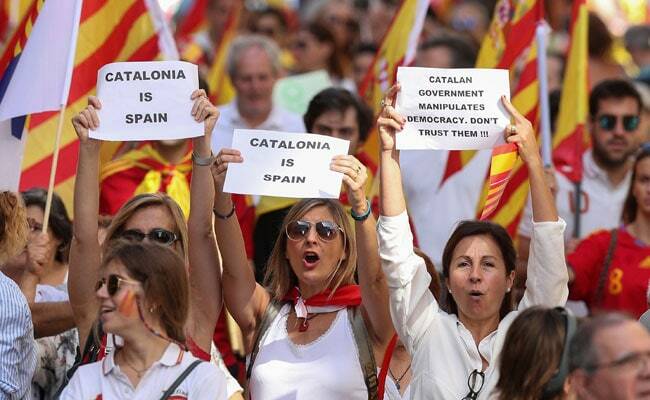 More than 90 percent of the 2.3 million people who voted backed secession, according to Catalan officials. But that turnout represented only 43 percent of the region's 5.3 million eligible voters as many opponents of independence stayed away. The Spanish government sent thousands of national police into the region to prevent the vote. About 900 people were injured when officers fired rubber bullets and charged crowds with truncheons in scenes that shocked Spain and the world, and dramatically escalated the dispute. Losing Catalonia is almost unthinkable for the Spanish government. It would deprive Spain of about 16 percent of its people, a fifth of its economic output and more than a quarter of its exports. Catalonia is also the top destination for foreign tourists, attracting about a quarter of Spain's total. The political stand-off has pushed banks and companies to move their headquarters outside Catalonia. Concern is growing in EU capitals about the impact of the crisis on the Spanish economy, the fourth largest in the euro zone, and on possible spillovers to other economies. Some European officials are also worried that any softening in Spain's stance towards Catalan independence could fuel secessionist feelings among other groups in Europe such as Belgium's Flemings and Italy's Lombards. The demonstration in Barcelona was organised by the anti-independence group Catalan Civil Society under the slogan "Let's recover our senses" to mobilise what it believes is a "silent majority" of citizens in Catalonia who oppose independence. "The people who have come to demonstrate don't feel Catalan so much as Spanish," said 40-year-old engineer Raul Briones, wearing a Spanish national soccer team shirt. "We like how things have been up until now and want to go on like this." It was a second day of protests after tens of thousands of people gathered in 50 cities across Spain on Saturday, some defending Spain's national unity and others dressed in white and calling for talks to defuse the crisis. Until this weekend, Rajoy has remained vague on whether he would use article 155 of the constitution, the so-called nuclear option which enables him to sack the regional government and call a local election. Asked if he was ready to trigger article 155, Rajoy told El Pais newspaper: "I don't rule out anything that is within the law ... Ideally, we shouldn't have to take drastic solutions but for that not to happen there would have to be changes." The conservative prime minister ruled out using mediators to resolve the crisis - something Puigdemont has said he is open to - and said the issue would not force a snap national election. Rajoy added the government would "prevent any declaration of independence from materialising in anything". "Spain will continue being Spain," he said. Nicola Sturgeon, the pro-independence leader of Scotland, which voted to remain part of the United Kingdom in a 2014 referendum, said: "Everyone has to accept reality, this will not be resolved by both sides going to extreme positions." "You can't simply say in a democracy there is no legal or legitimate way for people to decide their own future, that would be an absurd position," she added.